At some point in life you'll come to a crossroads and be forced to choose one path or another. Our advice: choose the one with the best beer. 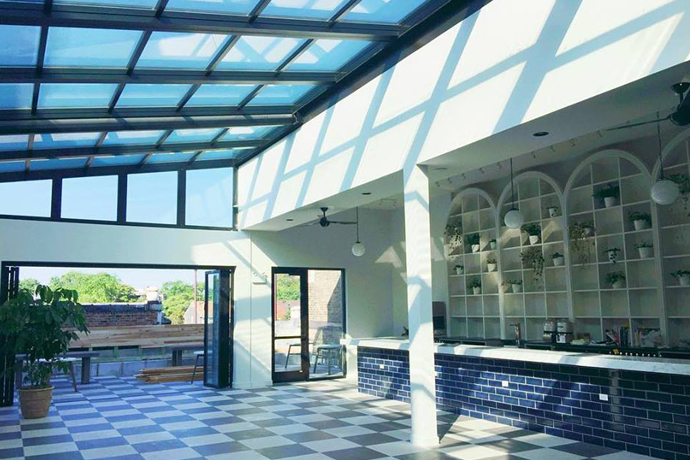 Introducing The CrossRoads Bar & Grill, now open in the West Loop, a gleaming new bar/restaurant with the grizzled heart of an old blues shack. The dream of a blues history buff, CrossRoads is like your windswept old friend from the South—quick with a beer, a shot and a comforting song. The name and boxcar motifs conjure up life along Mississippi's legendary Blues Highway, where rumor has it a blues musician once sold his soul to the Devil for fame and fortune (this is before Simon Cowell muscled him out of that racket…). So while you could treat this place as a civilized dinner spot, meeting workmates in a soft leather booth for polished comforts (Maker's Mark and Honey-Glazed Pork Chops), we like its grittier, bluesier side. Come in here on a night when you're ready to get a little rowdy, belly up to one of the glass-topped whiskey-barrel tables and chow down on Southern apps like deviled eggs and pork nuggets as you slow-hand your way through microbrews (Brooklyn Lager) and Old Styles in a can. And if you can't decide on a beer, don't. CrossRoads has a selection of brew mashups called Cross-Drafts, ranging from the traditional Black and Tan to the Jimi (Young's Chocolate Stout mixed with Purple Haze wheat ale).